OLYMPIA – June 29, 2016 – The Washington State Parks & Recreation Commission’s Folk and Traditional Arts in the Parks Program invites the public to “Kick Up Your Heels and Dance,” a series of family dances with live music this summer at Cama Beach Historical State Park. Family square dances were a traditional part of 1930s summer activities at Cama Beach when the state park was a fishing resort. The summer dance series brings live music and experienced callers whose aim is to get everyone on their feet and dancing. 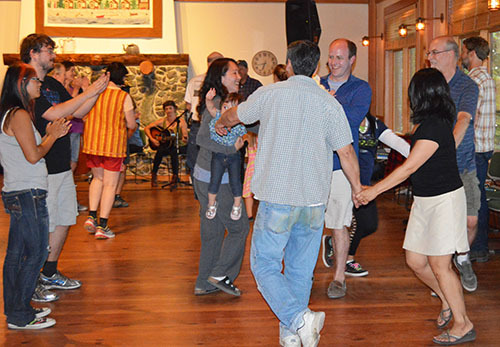 Each family-oriented dance is open to all ages and all levels. Callers will teach circle dances, square dances and contra dances. All of the programs are free of charge. A Discover Pass is required for parking at Cama Beach. All concerts are accessible to persons with disabilities. For special accommodations, please call the park at (360) 387-1550 or the Washington Telecommunications Relay Service (800) 833-6388. Requests must be made in advance. The dances at Cama Beach State Park are part of a broader series of events celebrating Washington’s diverse cultures presented by the Folk and Traditional Arts in the Parks Program, with funding provided by grants from the National Endowment for the Arts and the Washington State Parks Foundation. Cama Beach Historical State Park is set in a spectacular, 433-acre waterfront location against a forested backdrop on the southwest shore of Camano Island facing Saratoga Passage. Cama Beach offers visitors a chance to step back in time to a 1930s-era Puget Sound fishing resort complete with waterfront cedar cabins and bungalows. The park is connected by a mile-long trail to Camano Island State Park, a 134-acre camping park. Both parks are open for day use or overnight stays year-round. For more information about Cama Beach Historical State Park, including how to reserve a cabin, visit: http://parks.state.wa.us/483/Cama-Beach.